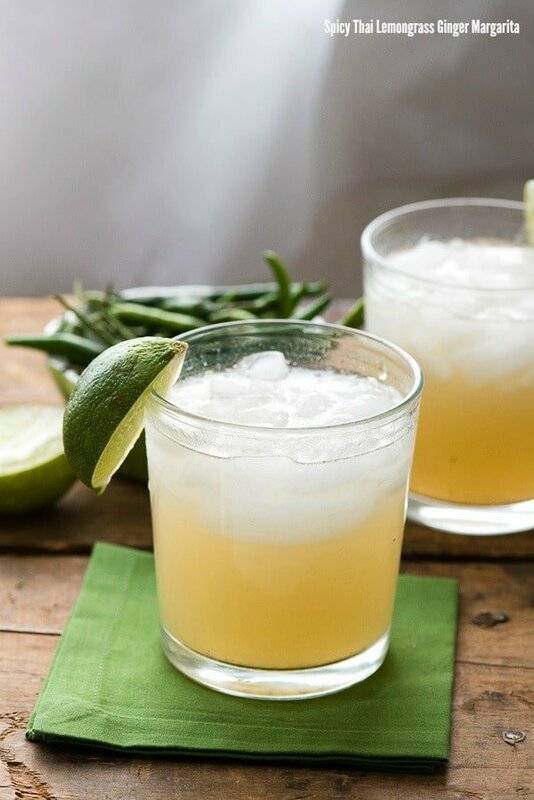 Thai lemongrass ginger margaritas have a kick of Thai spice and bright, exotic, mouthwatering flavors you’ll love! 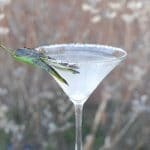 This margarita recipe post is sponsored by Boulder Locavore partner Gourmet Garden and is for viewing only by those of legal alcohol purchasing age. Please always remember to drink responsibly! Last week I lumbered onto an airplane at 11:29 p.m. wearing four layers of clothing complete with an orange down vest, only to be greeted in Miami Florida at 5:43 a.m. by breezy, bronzed residents traipsing through the airport in tank tops and flip flops. A respite from winter had arrived. 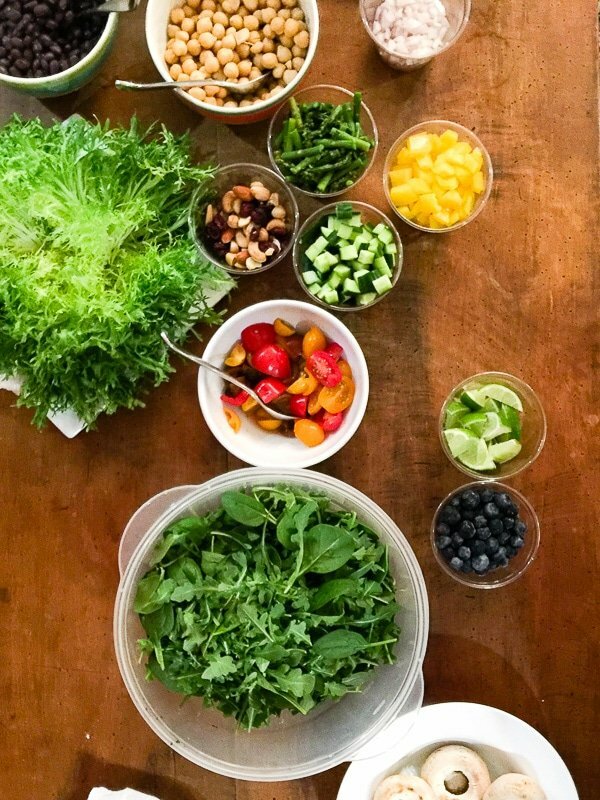 The whirlwind not-even-36-hours trip was courtesy of a new Boulder Locavore partner, Gourmet Garden, who had asked I attend an intimate event in Miami on food storytelling. Though I’d read the event primer, I really did not know what to expect until arriving at the exotic home in Coconut Grove which had been rented for the event later that afternoon. What a delicious day lay in wait! The gathering was facilitated by noted luminaries in all fields of food storytelling. 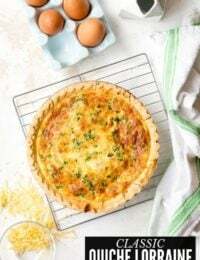 Molly O’Neill, author and former New York Times food columnist, had pulled together cohorts to share tips and insights with an intimate-sized group of local women food professionals. Huddled around an open living room we were fortunate to watch Betsy Andrews (Editor at Large for Rodale Organic, formerly of Saveur Magazine) navigate the finer points of interviewing and identifying storylines as Jeanne Baron (award winning radio broadcast journalist with NPR) shared her tips from the vantage point of an auditory journalist. Amy Halloran (author) provided a live focal point as she enthusiastically wound us through the story of the renaissance of grains while Betsy and Jeanne highlighted live how to navigate, respond and capture the essence of Amy’s enthusiastic storytelling. 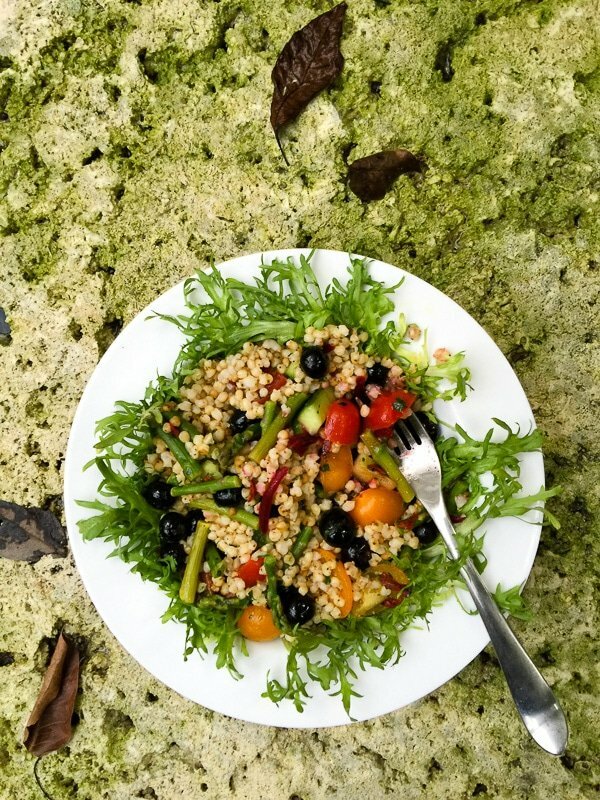 My food photo of Sorghum Salad on the mossy pool deck shadowed by the moody pre-storm Miami light. Libbie Summers (author, videographer, photographer and blogger) shared methods and examples of video creations telling stories through visually conveying an essence of the food story rather than just a literal depiction. Last but not least Shannon Kinsella (professional recipe developer and head of Gourmet Garden’s recipe development) walked us through her recipe development process, leaving creations for an impromptu photography session around the compound where we spent the day. I should note, throughout the afternoon and evening I was able to hear the longer version of these women’s personal food journeys and successes in the professional world, and my notations of who they are found above constitute a mere smidgen of the tip of each of their personal icebergs. They are each fascinating, funny, impressive powerhouses, with whom I could have spent much more time. 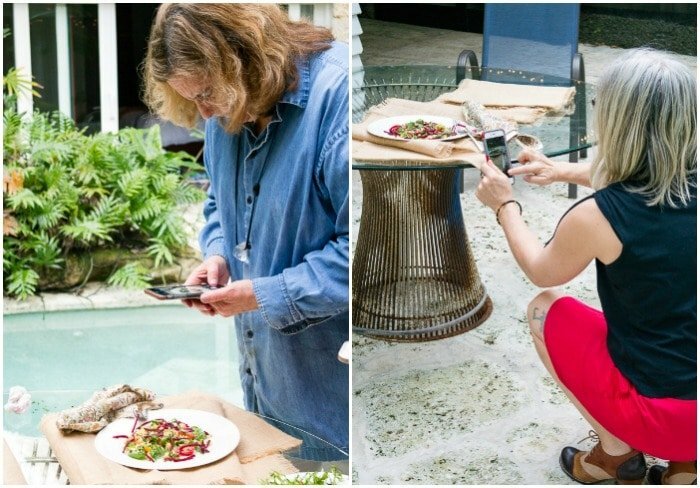 Molly O’Neill (left) and Jeanne Baron (right) experiment with smart phone food photography. Our afternoon wound through sharing of ideas, and casually comparing perspectives and methods with each other, with inspiration sparking for everyone in attendance. 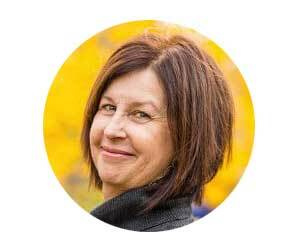 We each were from different backgrounds and platforms of expression, spanning food public relations, blogging, cookbook authors, newscasters and more. Our work of the day flowed into an extraordinary dinner with chefs Alex and Sara Martinez preparing an authentic paella dish which was as visually striking as it was delicious. 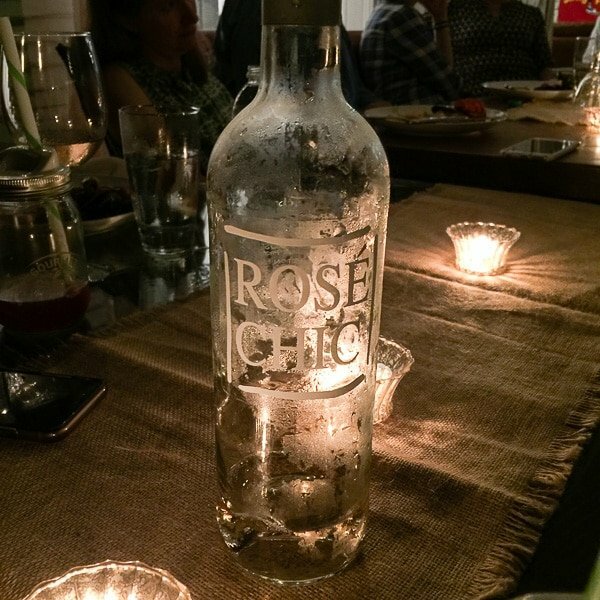 Robert Courreges hosted a tasting of his Rosé Chic wine, perfectly paired with the paella and a tres leches cake. 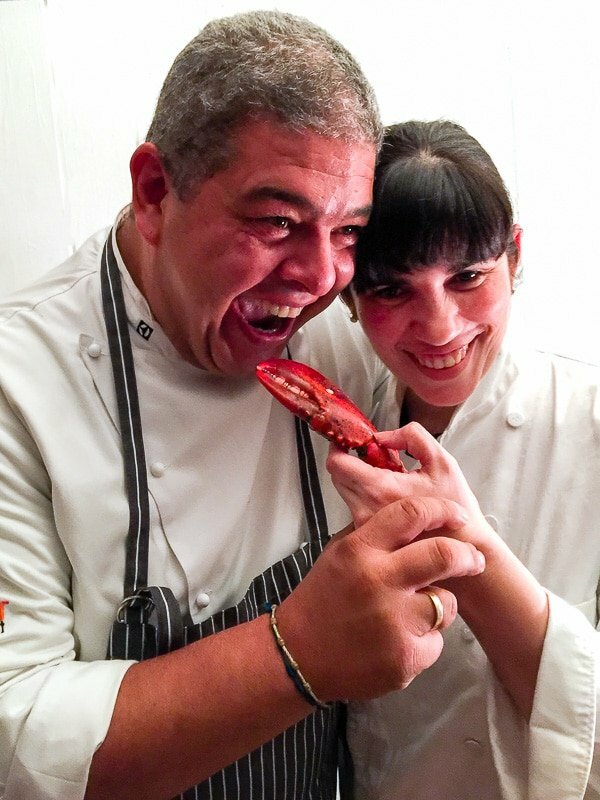 Chefs Alex and Sara Martinez who prepared the gorgeous Paella for our dinner. The meal flowed like warm molasses on a balmy Southern eve, allowing lingering over each other’s stories of how we’d become who we are now in our food roles, laughter and embrace of the group dynamic shared under the umbrella of the tropical Miami twilight. I was grateful for the chance to meet and connect with these special women, teachers and participants, and will hope our paths will again soon cross. A part of the evening I particularly enjoyed was some DIY mixology lead by Betsy Andrews. Armed with a few recipes, craft gin and amazing ingredients from the event sponsors (Gourmet Garden and Love Beets) we shook, stirred, strained and sampled to the rigor of Betsy’s impromptu testing of our measurement prowess in the field. 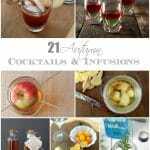 My wheels were churning with recipes ideas before I departed for the night and I couldn’t wait to get back to my kitchen to start whipping up new libations inspired by the bright, fresh flavors we had enjoyed. 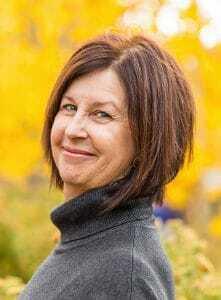 If you are not yet familiar with Gourmet Garden, it is a company you’ll want to know. They produce lightly dried and stir-in paste herbs that are refrigerated and last for three months after they are opened. I use fresh herbs all the time when cooking and find when I buy the small fresh packets at the store they become devoured in my overstocked fridge, only to become a full blown science experiment by the time I find them again. Gourmet Garden lightly dried herbs are in small tubs designed for easy stacking so they don’t disappear in the fridge and are convenient to access when cooking. The stir-in paste herbs come in tubes and I find myself using them almost daily in whatever I’m cooking. They are organic (except the ginger), fresh and beyond convenient for use (you can find them in the refrigerated section of many grocery stores). I have been obsessed with the Lemongrass Stir-In Paste in particular. If you’ve used lemongrass, you’ll know (and most likely love) its clean botanical lemon flavor but also that it’s difficult to work with. 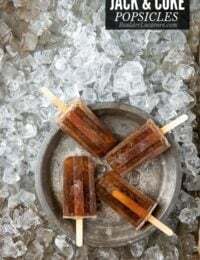 It is a long woody stalk that imparts wonderful flavor but isn’t in a form that is easily consumable. Lemongrass Stir-In Paste opens up a whole new opportunity for using lemongrass, and of course I felt it needed to be in a cocktail! With a warming of the weather it’s beginning to feel like Margarita season to me. 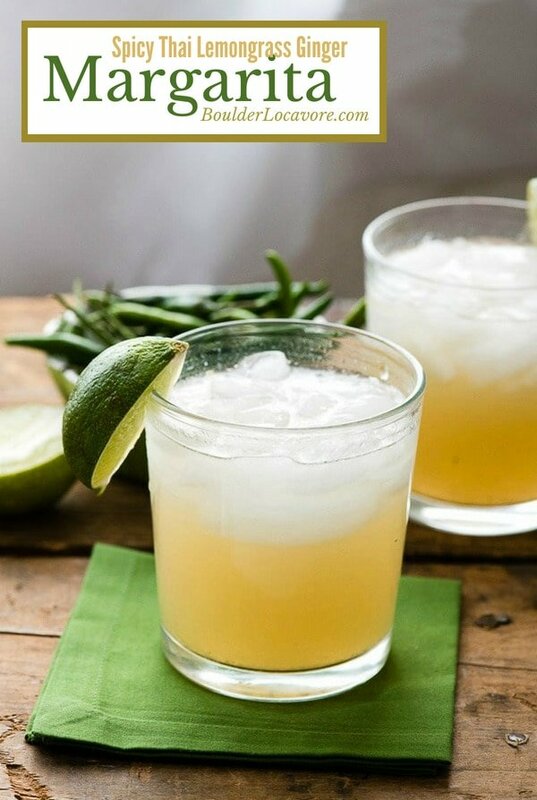 I prefer fresh-style margaritas which are made with good quality tequila, fresh lime juice and agave nectar for sweetening. 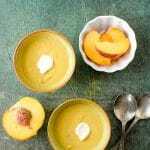 Those three ingredients set the stage for other flavors to shine. Perhaps it was the balmy Miami evening or the exotic flavors of our meal together but I felt inspired to make a Spicy Thai Lemongrass-Ginger Margarita. I picked up some Thai Bird Chilies from my local Asian market and the rest was a cinch with Gourmet Garden’s lemongrass and ginger pastes; perfect for muddling and shaking into a cocktail. 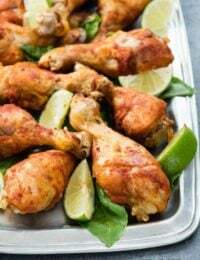 If that isn’t easy enough Gourmet Garden also has a Thai Seasonings paste that includes chile, cilantro (coriander), lemongrass and ginger which would also make a tasty margarita and omit the need for using fresh bird chilies. A note on bird chilies. 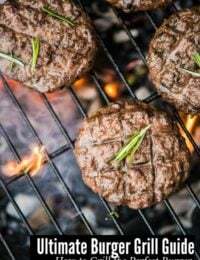 Don’t let their diminutive size fool you; they pack a punch of heat. One will be plenty to spice up this cocktail and let the other Thai flavors sing. Be sure to wash your hands well after working with chilies as well. 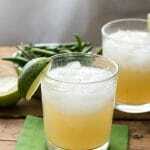 Fresh flavors of ginger and lemongrass make this mouthwatering Thai-style margarita a special cocktail. 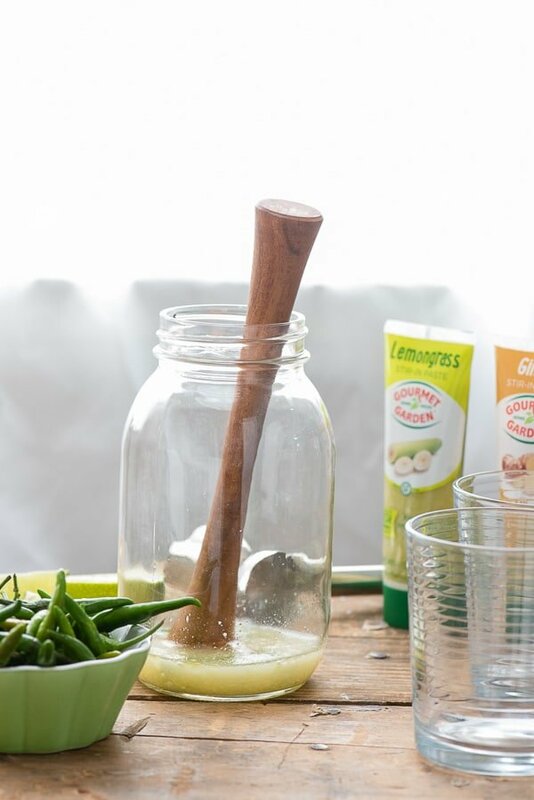 In a shaker or quart Mason jar, combine the chile, lemongrass, ginger and lime juice. Muddle the chile well. Add the tequila, agave nectar and 1 1/2 cups of ice. Shake vigorously for 1 minute. Strain into 2 8-ounce Old Fashioned glass filled with fresh ice. Garnish with lime wedge (optional). I have to share one more photo of the paella. It tells its own food story visually and most certainly with the entwining of its flavors. Disclosure: Travel expenses for the Food Stories workshop were provided by Gourmet Garden, as well as compensation for creation of this delicious cocktail! All opinions are my own. This looks like fun. My husband would love the seafood dish. I also love using my smartphone for food pics when I am in a hurry. Works pretty good. I have never tried lemongrass, especially in a cocktail! This looks absolutely amazing! Ah, you did have a nice time. And hooray for warm weather! Oh my! My mouth is watering over this post. Paella? Just yum! 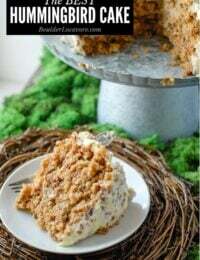 These look like great recipes to try out, so delicious. My stomach is growling now! This sounds like a really interesting drink! I’ve never had anything like this before. This sounds like it was a fantastic night. I will have to get the ingredients i need to make the Margarita recipe this weekend. Glad to know these food stories workshop! I think food workshop can improve our skills in food and kitchen. It’s to nice to know that there is a lot of good stories behind this workshop. Thanks for the special recipe. Now this sounds really good. I haven’t made a spicy margarita with these flavors before! 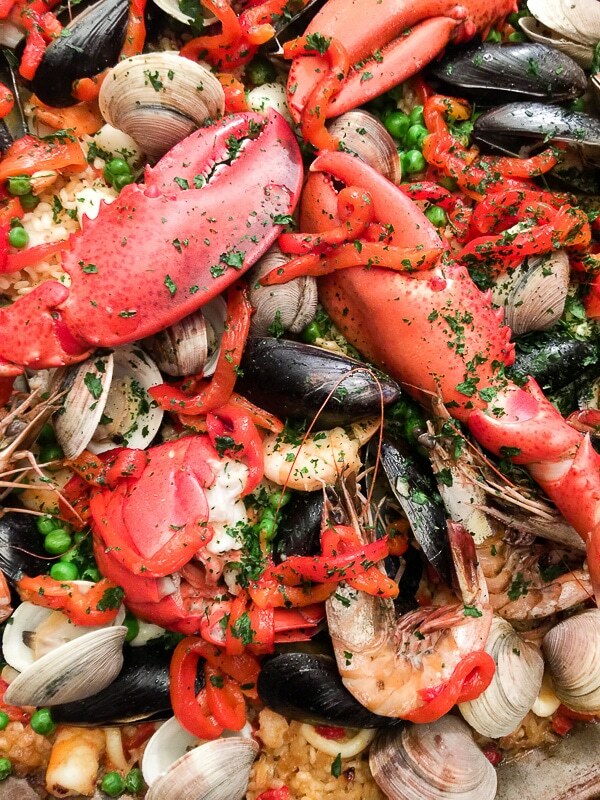 Gosh that paella looks incredible too. I’d likely have to pass on the margarita. I can’t handle the heat. But that Paella, it looks amazing!!!!! I will look for Gourmet Garden lemongrass paste. It sounds like a wonderful ingredient for all kinds of things. 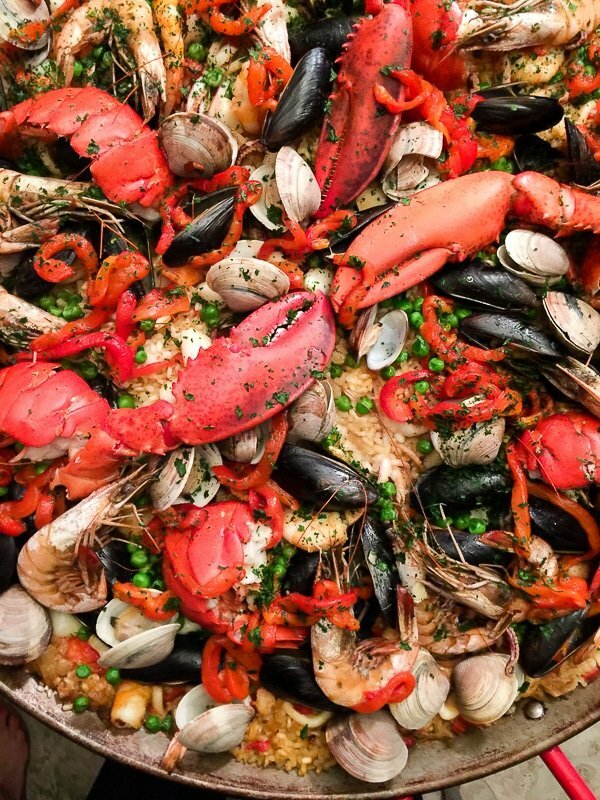 Seafood and I don’t get along with one another, but I certainly do enjoy viewing the paella in the picture. It’s obvious Chef Dennis knows his way around the kitchen. Yummm! This all looks so good, the photos are gorgeous, especially the lobster! 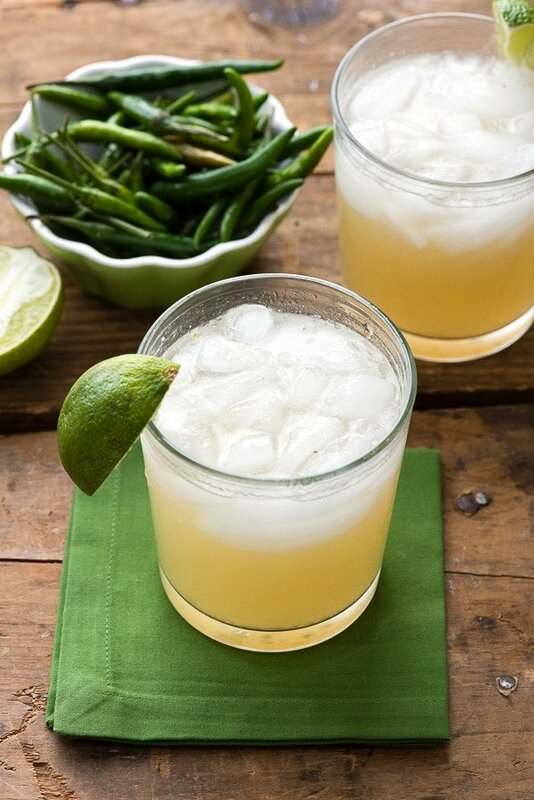 The margarita recipe I might have to whip up this weekend for our BBQ, thanks for sharing. I love lemongrass, but I agree that it can be hard to work with. I love the idea of a stir in paste. Thank you for making that long trek and giving us all a flavor of the inspiring people and gorgeous food you sampled. Most inspiring. I’ll be stocking more than one Gourmet Garden tub or tube in my fridge – especially the lemongrass. I’m glad to learn about them. 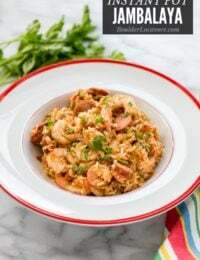 This recipe looks and sounds so good! I will have to try it, I know my husband would also love it! Paella is the BOMB! I could eat that stuff all day long. Margaritas and spicy flavors don’t do well with my palette. You have inspired me. We were going to do a stay at home date night this weekend, but now I’m thinking a nice restaurant with a delicious margarita. Maybe meet in the middle Stacie; stay home and make THIS margarita to feel like you are in Thailand?! Your recipe looks amazing! DIY mixologist indeed! Also, stir in-paste herbs are new to me – I need to give the basil and parsley a go. Really before discovering Gourmet Garden Monica the only thing similar I used was tomato paste in a tube. 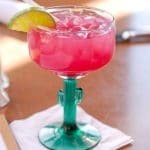 I seriously feel a world of ease and convenience has opened up; this margarita as an example! They are so convenient instead of measuring out herbs and they are fresh! You’ll love them. This sounds amazingly delicious. I absolutely love the flavor of lemongrass anywhere I can get it! I agree Allie! I need a crate of the Lemongrass Stir-In Paste. I’ve been baking with it and putting it in everything I can think of since it’s so easy to use. What a delicious recap of your trip Toni! I’m glad you got to experience a little Florida sun and warmth, although brief. I particularly loved your description of dinner “The meal flowed like warm molasses on a balmy Southern eve” I could hear Kevin Spacey reciting those lines! Next time you want to spend a few days in the Florida Sun, come stay with me! Thank Dennis! I wish I were able to have spent a longer time; it was a ‘flash in the pan’ so to speak. But a delicious one!